This is a guide written for players new to the game. Nothing is assumed, it's not even assumed that you've downloaded the game. So consider this a tutorial for first-time players. Players with some experience may benefit from it, but players with a lot of experience will likely not benefit at all. You should have already read the Object of the Game and be familiar somewhat with the concept of a light cycle, walls, and so forth. To understand what other players are talking about, and to understand the rest of this tutorial, some definitions are in order. Grinding is what happens when you rub your cycle against a wall. If you are running parallel to a wall and you are very close to it, you will be grinding. A sound effect and sparks will normally accompany a grind. Doublebinding is what is referred to when more than one key is bound to the same action. A detailed discussion is provided on the Double Binding page. Rubber is a mechanism that helps to account for lag. An understanding of rubber is only of arguable use, a detailed discussion is available on the Rubber page. Lag is the difference between what you see on your computer screen and what is computed on the server which centralises all the different players info. Digging is getting as close as possible to a wall without dying. This is done before grinding. This has also historically been referred to as a "pure grind." More jargon can be found in the Glossary. Armagetron Advanced works on the unique concept that a cycle can only accelerate by riding on another player's wall. The closer you are to a player's wall, the faster your cycle will accelerate. Brakes are provided, but they are disabled on many servers. Your cycle turns in right angles, typically, and leaves a long wall behind it wherever it goes. With this in mind, let's talk about movement. By default, movement keys are z and x, where z turns left and x turns right. v is your brake control. This stuff is fairly self-explanatory, but there are a few things to keep in mind. Turning slows your cycle down. This is a useful fact on servers that disable braking because you can use a series of rapid turns to slow your cycle down if needed. As already mentioned, you make your cycle go faster by getting close to another player's wall, or your own wall. The closer you can grind the wall, the more speed you will gain. The tactical options available are numerous and new tactics are being developed all the time. The fundamental goal is to cause other players to crash, gaining points for each player you can cause to crash. In this way, Armagetron Advanced is a passively aggressive game. There are no guns, no shields, no fists, nothing. There is no way to physically assault another player. All you can do is get the other player to crash into your wall, if you can do that. One of the first ways players learn to cause other players to crash is also a very direct way of attacking somebody. Simply put, you place a wall in their path by driving across their path. This is a very basic move and is generally considered to be a stupid way to die. You can imagine how entertaining it can be to get older, more experienced players with it. Probably the most direct way you can attack somebody is to put a box around them. It's simple, grind enough walls in succession that when you approach another player, you can drive a square around the player, leaving him in a small box from which he can't escape. This is generally called a speed kill, for what are obvious reasons. Many strategies are just variations on the box attack described above. 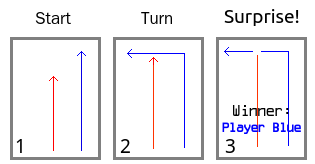 Through a combination of trickery and smart moves you can convince many players to enter an area closed on 3 sides, and then quickly close the fourth side. The larger the box, the longer it will take for that player to ultimately crash. Even larger boxes will fail because many players are skilled at getting out of them. In order to close a player into a box, an important skill called "sealing" is required. Sealing is just a matter of grinding closely enough to the walls you're trying to seal that another player can't get out with a closer grind. The speed kill and the box attack are fairly simple and easy to master. Unfortunately, you'll find that many players aren't susceptible to them. The speed kill has the advantage that it is possible on some servers to gain so much speed that no player, no matter how skilled, will be able to counter the attack. But the more skilled a player is, the higher your speed must be to succeed. It's the same with the box tactic. The more skilled a player is, the smaller the box that is required to ensure a point for you. The smaller the box, the closer you have to be to the other cycle, and the closer you are to the other cycle, the higher the likelihood that they will attack you successfully. Nevertheless, these two tactics are the two from which all other tactics are derived, and it's important that you work with them and learn the underlying tricks to use them successfully. Not happy with with the color of your trail, or your bike? Want to change the color of your chat-text? How about the floor grid, or the walls even? You can customize nearly anything you see, and here's how. Don't go overboard, however, since all renditions will use up valuable CPU processing-time and reduce your fps. Check out Effects and Display to increase your screen refresh rate. This page was last edited on 22 July 2011, at 09:09.